Bold and industrial, prominent metals in interior design are more often seen in large commercial spaces – but how do they translate to the home? 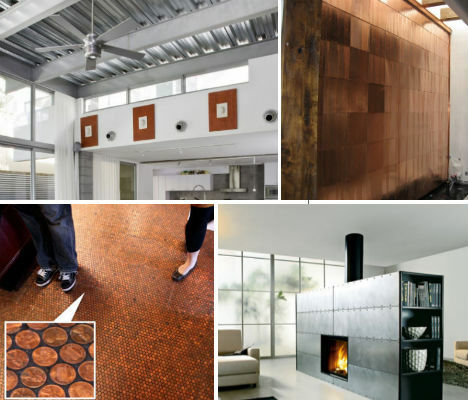 Fans of the luster and shine of steel, aluminum and copper can bring the modern minimalism of these metals into living rooms, kitchens and entire indoor spaces with these 12 metallic interior design ideas, from striking details like fireplaces and water fountains to larger applications like walls and ceilings. 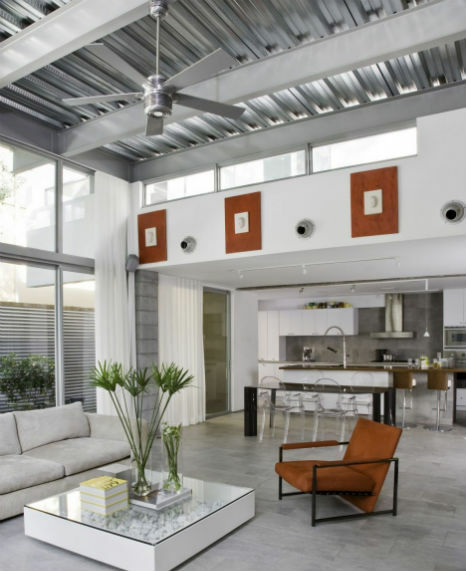 Cost-effective and totally unexpected, the ribbed metal ceiling in this Coconut Grove, Florida home by Mateu Architecture echoes metallic elements used in the kitchen and outside the house. Stainless steel tiles aren’t unusual in bathrooms or as back splashes in modern kitchens, but it’s their use here to cover an entire living room wall that puts them in a whole new light. 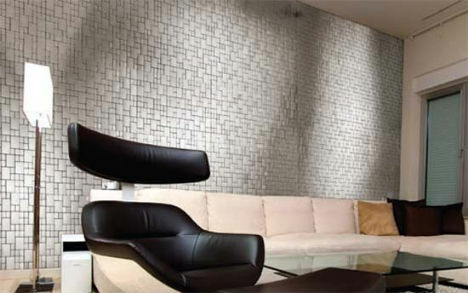 Shimmering and textural, this tile application creates an eye-catching accent wall. 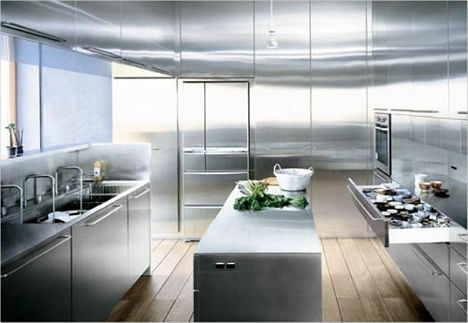 Shiny metal is much more than just an accent in this modular kitchen. Calling to mind commercial kitchens in which every surface must be easily sanitized, but on a smaller scale, the minimalist result is clutter-free and contrasts nicely with a natural wood floor. 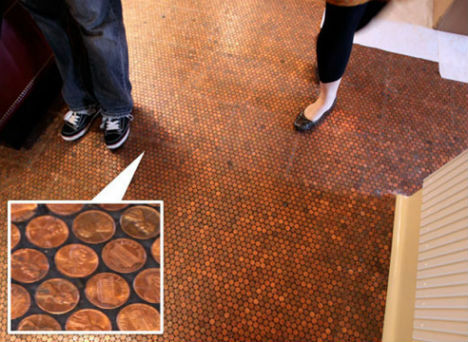 At about $2.50 per square foot, paving your floor with money is not as extravagant as it sounds. Though they’re now made mostly of zinc, pennies still give off a beautiful copper sheen, and their natural patina lends a variegated result that is rich and subtly shiny. 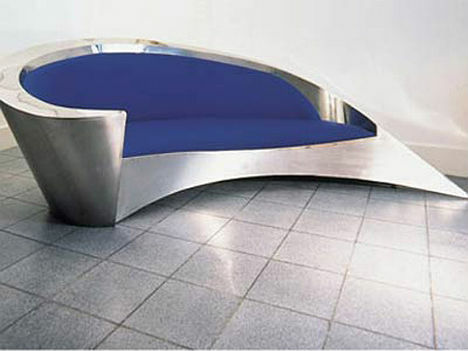 Looking like it was carved from one solid block of metal, this curving sofa in a shape reminiscent of a sea shell is definitely a bold way to bring metals into your living room. Seemingly seamless, the B3 Monoblock by Bulthaup so strongly resembles a solid block of metal that it causes people to wonder whether you hauled it up to your apartment with a crane. 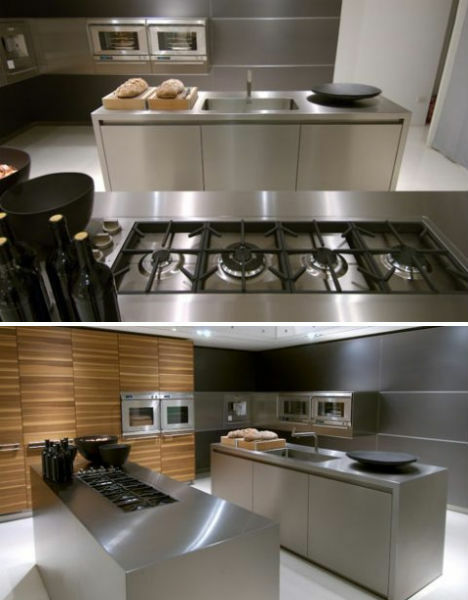 Custom-made of high-grade stainless steel, these lustrous kitchen islands are totally lust-worthy. Since stairs are often located in the heart of a home, they provide another opportunity to stun with steel. 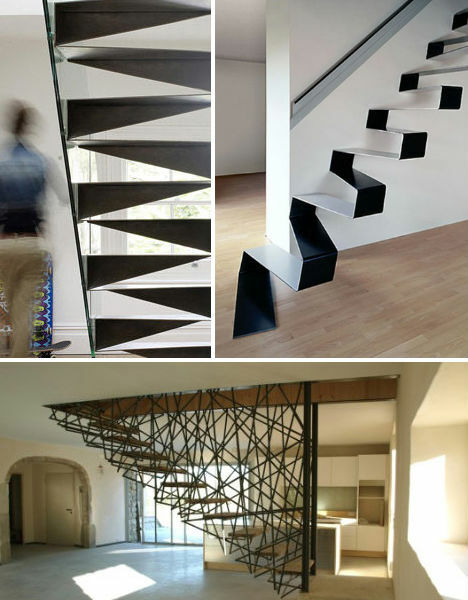 These three creative sets of metal stairs in unusual designs certainly stand out. 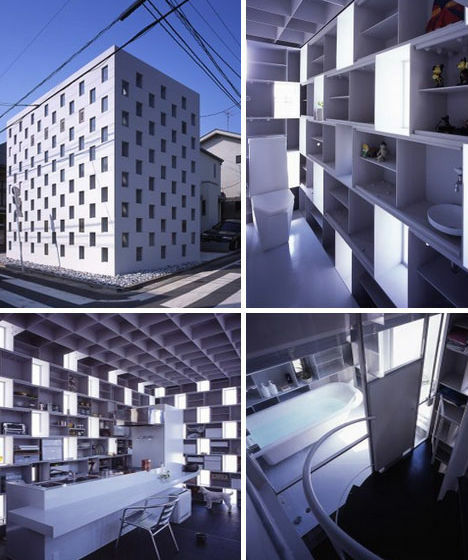 For this prefabricated home in Kanazawa, Japan, architecture firm Atelier Tekuto formed the interior spaces using molded aluminum rings, left unfinished so that the wall and ceiling surfaces of the home are entirely metallic. 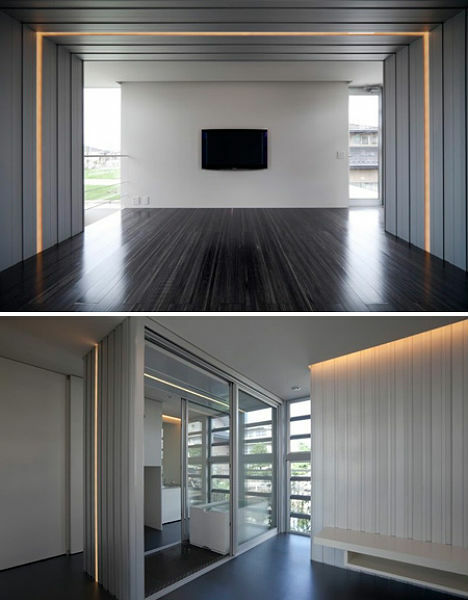 The architects cut energy costs by 80% by putting the reflective qualities of aluminum to good use, installing small LED lights directly into the ceilings and walls. A column of steel stretching from floor to ceiling makes the living room fireplace an even bigger draw. 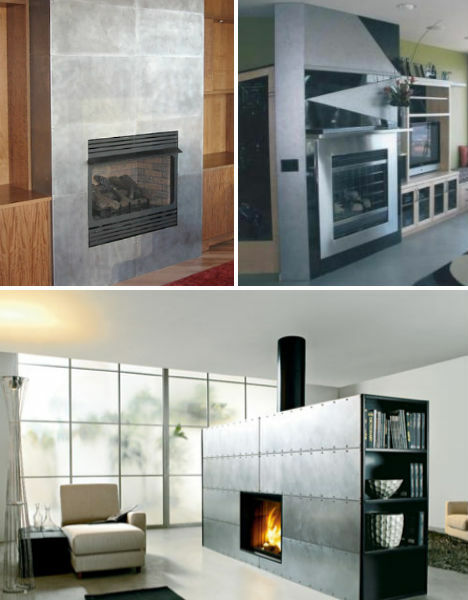 These three examples include minimalist matte cold-rolled steel, a more artistic reflective stainless steel surround and a free-standing modern fireplace that even includes storage space. Water fountains are perhaps one of the easiest ways to bring metallics into your home in a big, bold way – in many cases, you simply hang the fountain on wall brackets and plug it in. Other installations can be more complex, like built-in water walls. 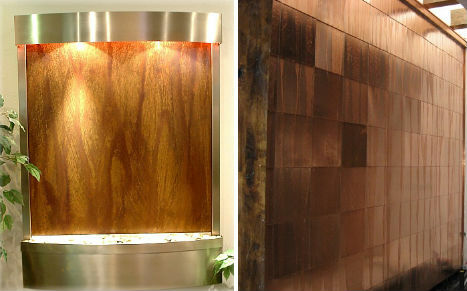 The reflective qualities of the metal give the falling water even more sparkle. 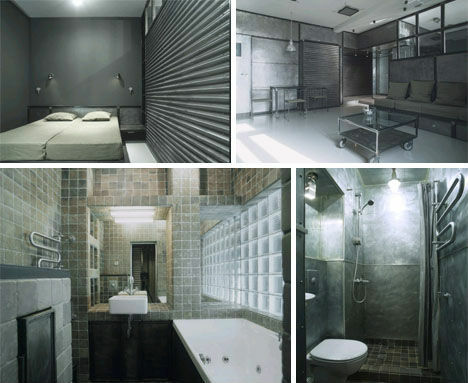 Taking the whole ‘metallic interior’ theme to an intense extreme, this apartment design in Moscow by designer Peter Kostelov is startlingly industrial – some might even say prison-like. But even if you consider this much metal to be overkill, you can’t say that the space isn’t visually engaging with its patchwork of textures, visible welds and exposed rivets. Atelier Tekuto’s beautiful all-metal house may be even more extreme than the metal apartment interior, but at least it’s light-filled with a grid of glass openings in the steel sheath. The steel boxes in the metal walls aren’t just visually striking and convenient for storage; they’re load-bearing, and also designed to regulate indoor temperatures as the seasons change. It really look stylish, and that model is simply excellent! looking very nice. i like your post. Thanks for sharing.